On May 2, 2016 the Journal of Development Engineering (Dev Eng) will officially launch at the 2016 International UNESCO Conference in Technologies for Development: From Innovation to Social-Impact (Tech4Dev). The conference is hosted by the Cooperation & Development Center (CODEV) at École Polytechnique Federale de Lausanne (EPFL) in Lausanne, Switzerland. 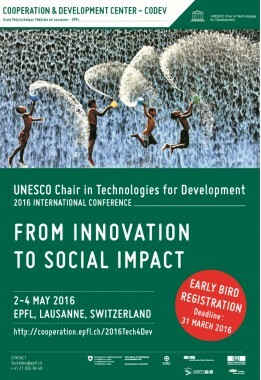 Established in 2007, Tech4Dev is the flagship event of the UNESCO Chair in Technologies for Development. The Conference is focused on the application of technology solutions to advance inclusive social and economic development in the developing world. This year’s convening serves as the official launch of the new open access, interdisciplinary journal. Dev Eng is a forum for engineering and economic research applied to the problems of poverty. Published by Elsevier, the journal showcases research on innovative technologies designed to improve welfare in developing countries, along with novel measurement tools that aim to improve the quality of data on development outcomes. The first issue of Dev Eng is currently available on ScienceDirect. “We are pleased to partner with EPFL conference leaders and Elsevier to launch the Dev Eng journal at this conference. It is an opportunity for the journal to make new connections and invite submissions from Tech4Dev conference participants,” said Co-Chief Editor Professor Ashok Gadgil, a professor of Civil and Environmental Engineering at the University of California, Berkeley. Dev Eng encourages collaboration and learning among engineers, economists, and other scientists. It is also committed to promoting high-quality research by scholars from low- and middle-income countries. To actively cultivate contributions from developing country authors, the journal is designing a novel Co-Mentorship Program. The initiative will aim to bridge the publishing gap faced by developing country scholars while also facilitating meaningful collaborations between researchers in industrialized and less developed countries. “This launch event will include expert panels discussing the journal’s focal research areas, including the design of technologies to measure development outcomes. It also gives us an opportunity to discuss the editors’ commitment to open and reproducible research practices” said Temina Madon, Executive Director of the Center for Effective Global Action. “Open Science: From Research Transparency to Inclusive Authorship,” a panel discussion moderated by Sarah White, Senior Program Associate at the Center for Effective Global Action. Dev Eng accepts manuscripts on a rolling basis and is currently soliciting new submissions. The second issue is expected to close in December, 2016. Prospective authors are encouraged to visit and submit their work at the Dev Eng website: http://tinyurl.com/DevEngSubmit. The journal is supported by the Development Impact Lab, led by UC Berkeley, with support from the U.S. Agency for International Development, the Blum Center for Developing Economies, and the Center for Effective Global Action.